you may Print or "Save As" to your Desktop or Documents files. When you are done, click your browser's back button to return to this page. Find more Cross Stitch Borders , Cross Stitch Alphabets, and Free Cross Stitch Charts featuring adorable baby and nature themed charts here. 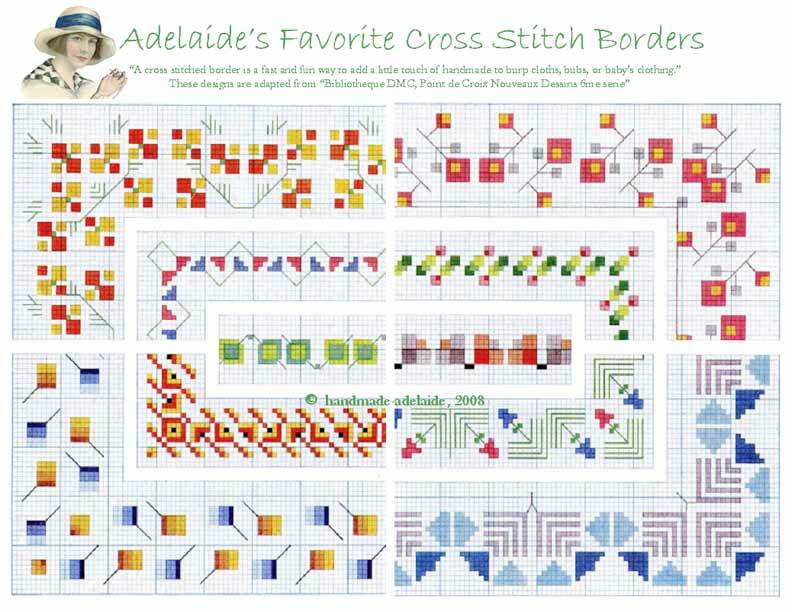 You will need a copy of Adobe Acrobat Reader to access these free cross stitch patterns. You may download a copy of the software free by clicking the button below. Thank you for your patience as this loads. These beautiful cross stitch borders are from an antique French book of cross stitch patterns that are in the public domain. I have edited them to improve the quality and colors for your enjoyment and use. Please feel free to share, with a link back to my page. I love the geometric shapes and bright colors, which give them such a modern look that would be appropriate for baby boys as well as girls. I can see these border designs used on a blanket, burp cloth, or even a wool diaper cover or baby sweater. These simple and striking border designs will work up in your choice of colors, and add a unique handmade touch to your baby gifts. Don't miss out on the rest of these great cross stitch patterns! collection 1 has lots more pages filled with free cross stitch charts featuring fantastic cross stitch borders and repeating patterns. collection 2 has lots more pages filled with baby cross stitch patterns inclucing bugs and butterflies, animals, transportation, and other adorable baby themes! collection 3 features lots of great cross stitch alphabet patterns which are great for monograms and personlized baby gifts.